So, did you try to Catch 'em All with that game? Are you still playing? 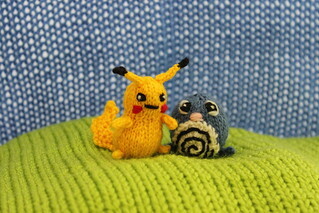 Did someone show you that you can knit/crochet 'em all? I caught some, still play a little, and knit only a couple. I used my past experience and various patterns from Anna Hrachovec to guide me in the process, and that felt pretty good. For a moment I had ideas of making many and giving them as gifts because several people in the family played the game, but my enthusiasm for doing that went away a little quicker than their interest in continuing with the game. I think I might make more if/when the mood strikes, (I might even have part of one waiting for that mood) but for now, these two are it.